Hello and welcome to Webcomic Wednesday! Each week I trawl through the digital space to bring something new and exciting, and share it with you, the dear reader. This week I return with one of my favourite writers, and his pay-what-you-want digital series. 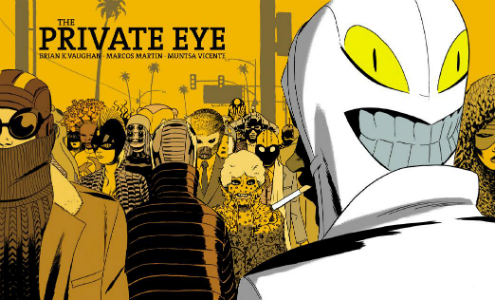 I’m talking about The Private Eye, courtesy of Brian K. Vaughan and Marcos Martin. Seriously, those names should be all I need to say for you to pick up this series. But, just in case, The Private Eye is the story of Patrick Immelman, a private-eye living in the far future. Set after an event where every single person’s entire digital self was opened up for everyone to see for forty hours, The Private Eye is a classic film-noir story set in an interesting, weird, and at times completely plausible future. To say anymore would ruin the fun. The writing is top-notch, which is what you’d expect from the calibre of names such as Vaughan’s, but Martin’s art is also fantastic. Both abstract and colourful, thanks to Muntsa Vicente’s varied colour palate, it really helps to set the tone of this neon-lit future where everybody is intent on hiding. Its bright-lights disguising a disgusting world and it plays out beautifully. Really, there isn’t much more I can say without spoiling anything. If you were ever a fan of Vaughan or Martin’s other work, then this should be a no-brainer. For everyone else, this should be a no-brainer too because it’s high shelf stuff for whatever you want to pay for it. Seriously, check it out. You can do so here. It’s three issues in and it is a treat.